Home Digital Whatsapp Delete For Everyone : Delete All Type Of Message Sent By Mistake . 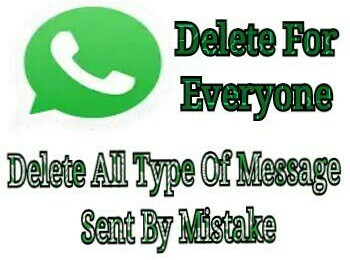 Whatsapp Delete For Everyone : Delete All Type Of Message Sent By Mistake . WhatsApp is one of the largest messaging application which have 1 billion downloads and rated at 4.4 on play store . The Facebook-owned company has added a slew of features to make its platform more useful and fun, with Stories being one of the most popular one. WhatsApp Stories has over 250 million daily users around the world . While using whatsapp sometime we all have come across a situation where a Whatsapp message sent by mistake has led to a lot of embarrassment. While other messaging apps like Telegram, WeChat and Viber already have the option to delete sent messages from a thread, it wasn’t possible for the Whatsapp users, until now , But now whatsapp is planning to add new feature of revoke or recall button which known as Delete For Everyone . With the recall button users can detete all types of messages like GIFs, videos, texts, documents and more . Also Read :- Whatsapp New PIP Mode Video Calling And Text Only Status Update Features . According to the reports from the fan site WABetaInfo, the WhatsApp messaging app is finally testing the feature and it will be called as Delete for Everyone feature. WhatsApp Delete for everyone which will allow its users to delete messages that have been sent by mistake before your contact reads them.WhatsApp is finally testing the Delete for Everyone feature.The server finally works and it successfully recalls the message. Also if the server works, this does not mean that the feature is currently enabled. It will be remotely enabled later, and seen that WhatsApp “enabled” their servers for the Delete for Everyone feature, it may really be enabled soon,” read WABetaInfo’s tweet. Also Read :- Transfer Money Through Whatsapp To Friends After The Integration Of Whatsapp UPI . A user will only be able to recall/delete the message if the recipient has not read/opened the message. For instance: if a receiver gets to read the message 1 minute after receiving it then the sender cannot delete the message 2 minutes (even if it’s within the allowed time period for deletion) after sending it. A message cannot be revoked if the receiver does not open the message for 5 minutes and you would like to recall it in the sixth minute.